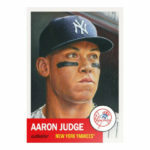 The Topps Baseball Living Set is an ever-growing collection of hand painted baseball cards inspired by the 1953 Topps Baseball collection. Three new cards are added to the set each week and are available for purchase for only one week. Final print runs for each card are solely determined by the demand on each order. Unless traded to another team, no player will ever be repeated in this set and there is no determined ending point which allows this set to continue to grow for years to come. The original artwork for this series is provided by Mayumi Seto, a renowned sports artist. Our checklist will include every card in this series as well as final print runs for each card. Our gallery, available under the tab at the top of this page, will also include a photo of each card. Click the name of a player in the checklist to be directed to eBay sales of that card. Bryce Harper receives his second card in the Topps Living Set. The first 99 cards have been issued for the Topps Living baseball card set and we have a breakdown of stats for collectors. Ronald Acuña, Jose Ramirez, and Matt Olson are the latest addition to the ever-expanding Topps Living Baseball series of on-demand trading cards. Rhys Hoskins, Ian Happ, and Nick Markakis were honored with the second wave of cards released as part of the Topps Living Set baseball card series. Topps announced the launch of a new series of baseball cards and released the first wave with Aaron Judge, Joe Panik, and Nicholas Castellanos.